The United States returned Wednesday hundreds of Iraqi artifacts its special forces recovered during a raid in Syria against a man described as the Islamic State group’s top financier. 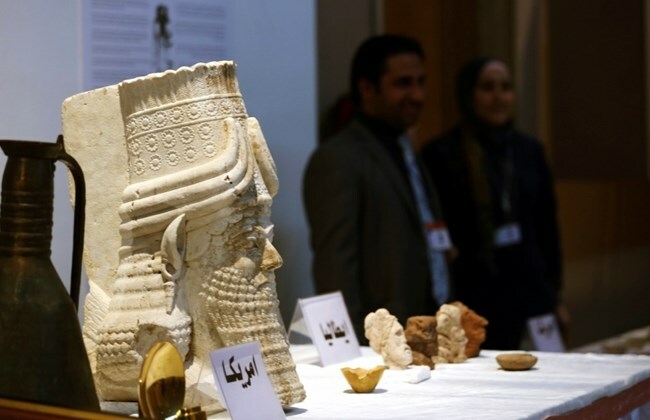 Some of the pieces were displayed at the Iraqi national museum during a repatriation ceremony attended by Antiquities Minister Adel Shirshab and US Ambassador Stuart Jones. “These artifacts are indisputable evidence that Daesh (ISIS) – beyond its terrorism, beyond its brutality and destruction – is also a criminal gang that is looting antiquities from museums and historical sites,” Jones said. “And of course the purpose of this is to sell these items on the black market,” he said. The pieces on display in one of the recently reopened museum’s main Assyrian halls Wednesday were small items, including coins, statuettes and jewelry. “The coins for example are from the Islamic period. This is evidence that this terrorism that claims such heritage is blasphemous is trying to profit from it by selling it,” Shirshab said. The artifacts were retrieved by the US commandos who carried out a rare raid inside Syria on May 15 during which Abu Sayyaf, a top ISIS figure, was killed. Abu Sayyaf was believed to be the jihadist organization’s top financier, and US officials said they were learning a lot by analyzing what the raid had produced. “These are very precious, priceless pieces,” said Hakim al-Shammari, head of the exhibitions department at the national museum. He could not estimate the black market value of the recovered artifacts but said they would have made a substantial contribution to ISIS finances. Officials at Wednesday’s ceremony provided few details on exactly where and when the returned artifacts had been looted. ISIS has captured much attention by posting videos of its militants destroying statues and heritage sites on the grounds that they are idolatrous. But experts argue they have mostly destroyed pieces that are too large to smuggle and sell off, and kept the smaller pieces, several of which are already resurfacing on the black market in the West. The US says it has repatriated more than 3,000 stolen artifacts to Iraq since 2005.